It’s a Saturday night and as usual, I’m home in bed. I was on my way to a lovely sleep, but that was rudely disturbed by someone who has zero regard for anybody else’s rest other than her own…but that’s a blog for a NEVER time. Typically I would be working on a school project right about now, but it’s Spring Break! Yeah…I should be in some tropical hotspot living it up or maximizing on some serious relaxation after the the quarter I had…right? Welp…no can do. Firstly, I already live in a tropical hotspot. Secondly, I really can’t relax too much because I have to prepare for April because stuff is about to get crunk. Thirdly (is that even a word? ), living lavida loca (did i just date myself? oh wait…you already know my age) is out of the question when you’re low on funds…temporarily. So what am i gonna do during Spring Break? I still have my radio show…so I’ll be doing that. Even though I can’t tutor my elementary kids because they’re on Spring Break too, that frees up a lot (and unfortunately no pay for me) of time for me to work on my presentation. I have a Broadcasting Club trip coming up next month. We’re going to Washington D.C. and I’m really excited about that. My professor asked me to do a 5 minute presentation on “How To Set Personal Goals”. That shouldn’t take too long to prepare. Then right after I come back from that trip, I have a conference in Hollywood (not California) where I’m one of the student speakers. So I’ll be working on my speech this week too. Did I also mention that my new internship begins April 1st? Yeah…gotta mentally prepare for that. I’ll be interning at a production company. I think on the first day I’m suppose to be working with Terry Bradshaw…yup…NFL Hall of Famer…on a new show he’s working on. I can’t wait! Seems like the pre-hectic has already started before April makes an appearance. So here’s what April will look like: Internship, taking Radio III course, tutoring, still doing my radio show (The Groove Room with Natasha Nicole…check it out! ), trip to DC, speaking at a conference, working my home-based business (trying to earn some extra cash), and running my parents around when they need me. Whew! Jesus give me your strength cuz i’m gonna need it! Staying busy is not an issue for me…I actually forgot I prayed about this. I tend to do that a lot…forget the conversations I have with God. Last year around this time, when I was working for Anthropologie, I told God, “I’m not doing anything other than working at a clothing store. I’m bored. I feel useless.” Well guess what…He answered. LOL But you know what? I’m grateful because even though I do get tired and sometimes overwhelmed to a point of tears, I’m having a blast. Tears are okay…it’s a cleansing mechanism. I cry it out, wipe my face and keep it steppin. I had to start using my planner again to keep up with myself. It fills up pretty quickly at times, but it also keeps me on task. Time is going by so quickly. I have to remind myself to pause for a second and take it all in while i’m on this amazing journey. So much more to come! I can’t even imagine what’s around the corner. So far the surprises have been great and I like surprises…good ones anyway. I’m praising God for the activity that you are able to enjoy! He is truly allowing you to life a John 10:10 experience in this season. Celebrate every bit of it!! And I thought I was busy! 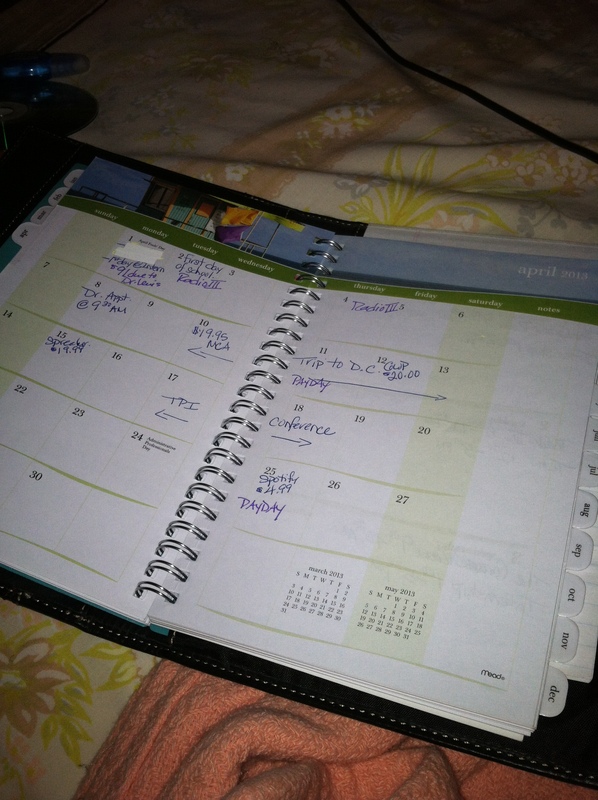 My April won’t be quite as hectic, but more to come about my time of forced leisure! Yeah girl it’s about to get real crunk. Plus in the middle of all that I’m trying to plan a surprise birthday party for my Dad’s 90th birthday coming up in May. Lord have mercy!